Fitzy here (the one who always shouts green army if you don’t already know me), covering for CBH whilst he is away on his hols and preparing for UTMB (Ultra Trail du Mont Blanc) which is next week, I’m sure you will all send him some hugs, kisses and good luck messages as I know how hard he has been training for this one, he’s even done some tarmac slapping along the way. Anyways onto this week’s news, and quite a bit to get through. 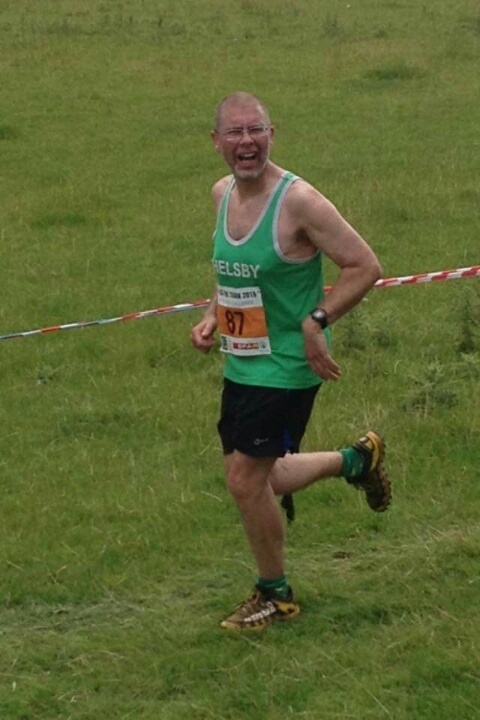 Also a mention to Paul Bulmer who hopes to complete his 40th Park Run at Delamere this coming Saturday. An amazing achievement for Paul and all his buddy runners. If you are around please try and come along and join in the celebration this Saturday morning at 9am. 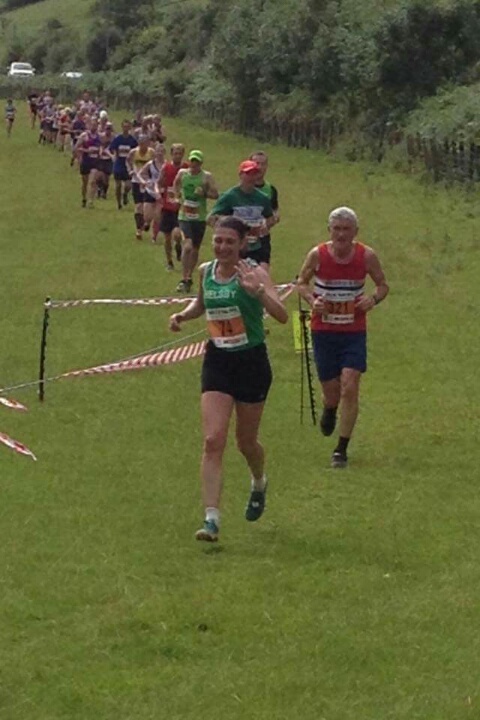 On Saturday I attended a fell race in Darwen in memory of my sister in law Catherine this is the 2nd year it has run in her memory and the numbers were up by at least 40 runners to over 140. So maybe next year we can get a few more from Fellsby. Rachel (the better half) always helps out at registration so my pre race routine was looking after Declan my 3 year old son.He was telling me all week how he was going to run faster than me,so an idea came into my head. I entered him into the fun run, with ten minutes to go I found out it was a mile long and knew then this wasn’t going to go well. After the first little hill he looked at me with a sad bottom lip, i’m not going to win dad am I. So after a little explanation I carried him for half a mile took a short cut and he ran downhill to the finish. He was really made up and even asked when do I get a prize. But it reminded me why we all run races no matter what age we are. We start off happy, soon become tired, feel like crying and at the end want to do it all over again. Just before the start I noticed another green vest of Tim Palmer after a quick chat it was back to warming up. This is only my 3rd race of the year so I wanted to see how my summer training of drinking and eating has paid off! The race itself starts in the main gala field across into the park then slowly up through woods on to a road up to the tower. Quick downhill then another long runnable climb back up to the moors where you follow a path which takes you to a single track Then you drop down back through the woods and park to the finish, crossing the finish you catch your breath and do the only thing left to do, queue up for a hot dog and a nice real ale. 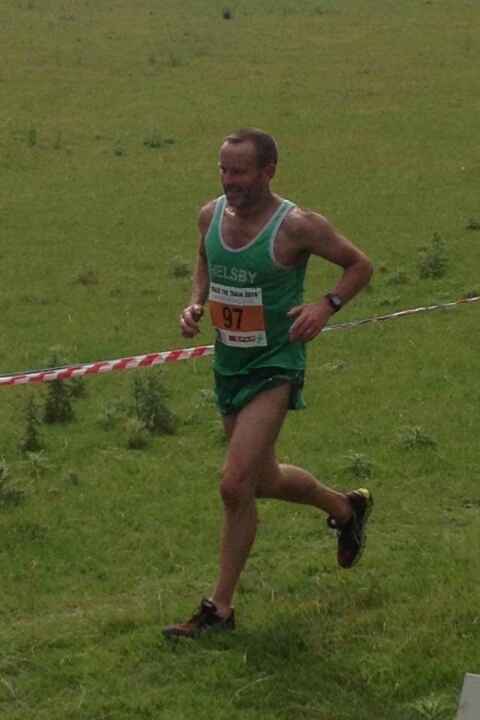 Got to say Tim Palmer ran a great race and is in good form, Jamie said he was flying up the hill. 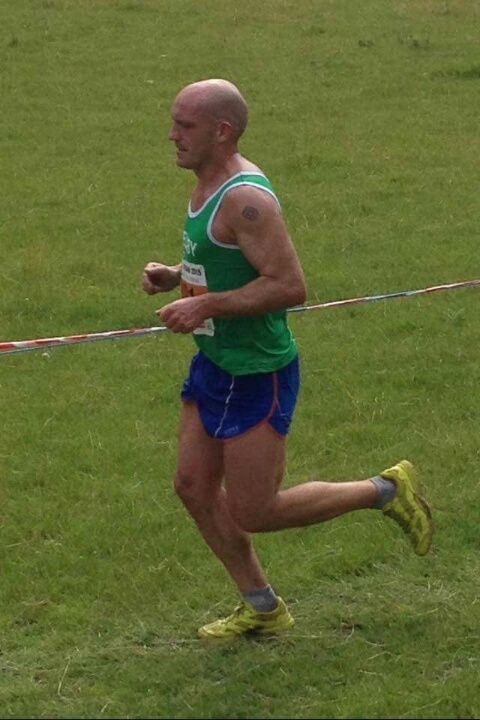 Nice one Foz, I know Jamie had a cracking day and Darwen running club should be applauded for putting on another cracking event in memory of his late wife. Now, over to our 8th ROAD counter of the season, I highlight road, because not a lot of us roadies did it because there was far too much mud & hills about, and you had to race a train, whatever next? 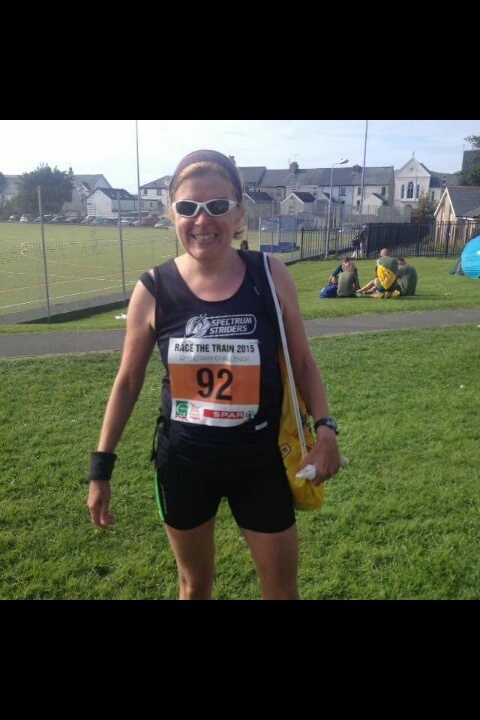 On Saturday there was drinking, eating, more drinking….oh and a train to beat in a race! 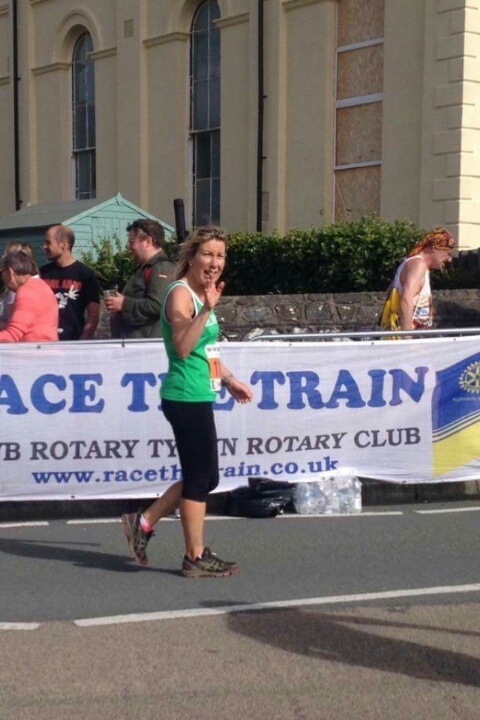 15 green vests ventured to Tywyn for this unique racing experience and our 8th road counter. 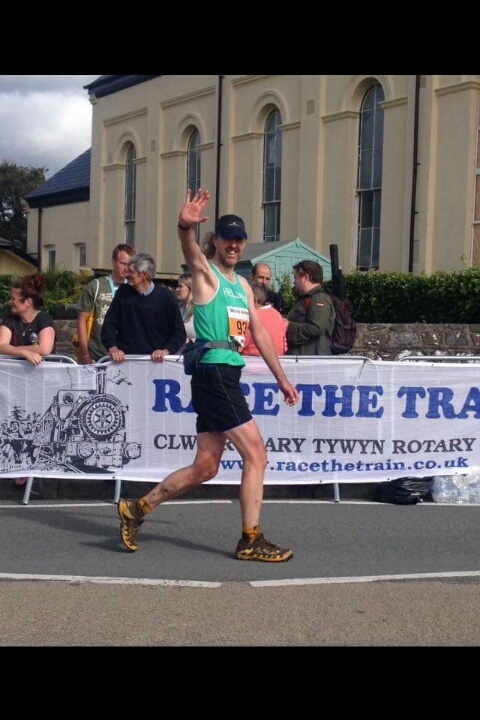 The premise is fairly straight forward, the runners set off on the 14 mile multi terrain course whilst a steam train runs adjacent to the course and the idea is to get back to the finish before the train. 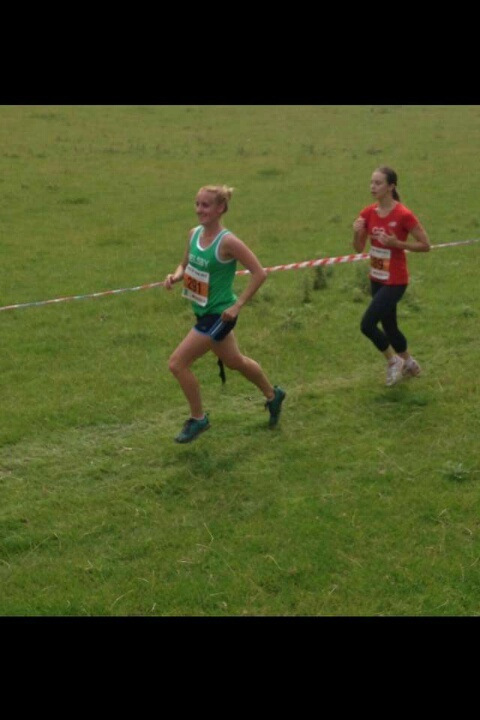 In reality only a small percentage of runners can actually beat the train but that certainly didn’t stop anyone from trying and putting in maximum effort! A big well done to everyone who participated, especially Phil Roberts who paced it to perfection and beat the train by a full minute! As spectator rather than competitor this year it was great watching the race unfold from a vantage point at the half way mark and everyone looked to be in fine spirits. An excellent post-race award ceremony in a marquee and a mini Ibiza experience (as well as 40th birthday celebrations for birthday girl Jane Ashbrook!) rounded off a very enjoyable weekend. Also thank you to Louise Spruce for taking these brilliant snaps! 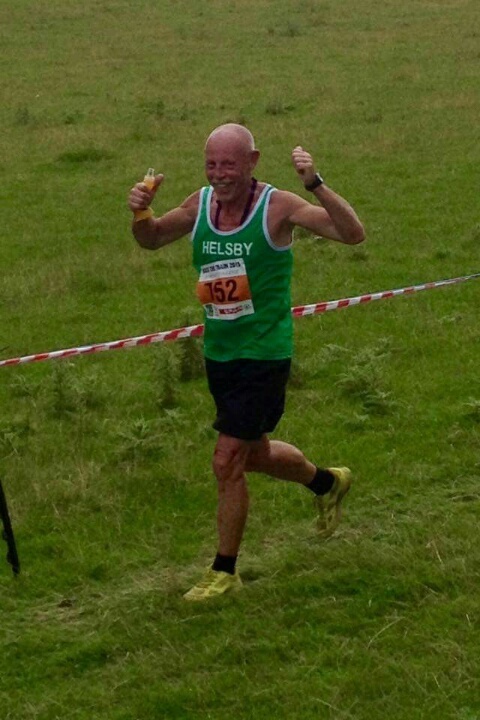 Thank you to everyone for helping me celebrate my birthday in style and also all at Helsby for your generous gift….a place in Hadrians Wall Ultra, I’m so excited and petrified, I am really touched and feel very lucky to be part of such a fantastic running club…green army rocks!! I’ll second you on that Jane, it’s a cracking place to be at the minute. A brilliant weekend away for the green army mixing good running with socialising. A pre-race party Friday evening set us all in high spirits for Saturdays races. The 10k, 5.5 and 3.5 mile races were in the morning meaning an early start for some. The 14mile Rotary Challenge had a relaxed start of just after 2pm when the fastest Talylynn train raised its head of steam to start the dash down to Abergynolwyn and back. The race route not always following the flatfish rail track as the second half climbs up the hillside steeply before doing a narrow slippy traverse. There were gates to hurdle, streams to wade, mud to slop through before the final road section to the finish line and celebrations. All lined by a great turnout of supporters everywhere. Good to see Louise & Col at the turnabout point, just when you needed encouragement. 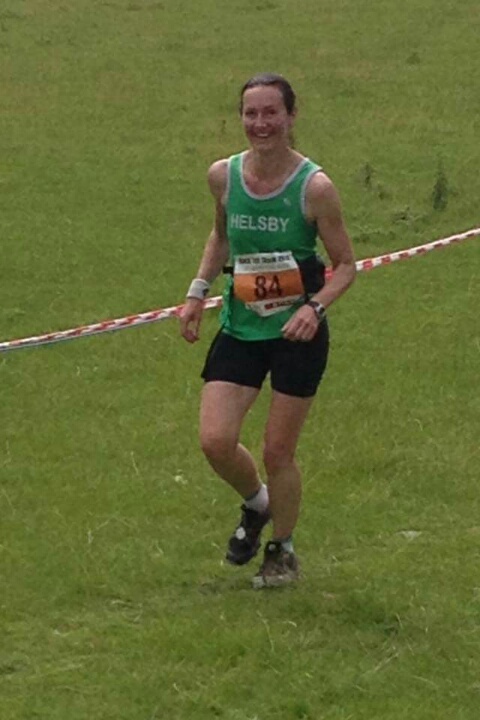 Great weather, course, atmosphere, support, camaraderie. We all visited the race beer tent on Saturday evening for the long drawn out presentations ( the only time all weekend for a quiet sit down!!). Unusually these days, no prizes for Helsby but we celebrated anyway. 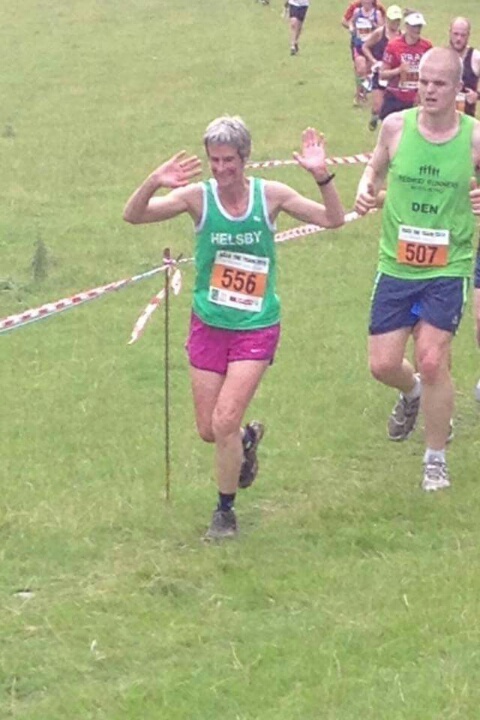 Very energetic dancing saw off any post race aches and stiffness with the final Hokey Cokey to the pretenders I will walk 500 miles finishing everyone off!!! Happy 40th birthday to Jane on Wednesday and Congratulation to Phil R for beating the train. Last report of the week and a very happy one if you looked at his face on Facebook, Ben Williams did the Marsden Moors Meander. A short report from the LDWA Marsden Moors Meander in West Yorkshire, which I ran/walked on Saturday. The route is around 22 miles, with about 3500 feet of climb. The 2014 event is my only DNF to date, so my only aim this time was to put that ghost to rest and get round in one piece. 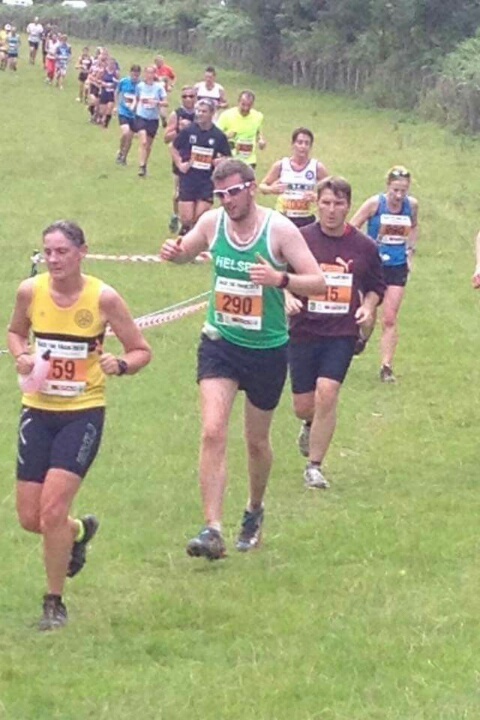 The run starts with a steep climb out of the village, and the whole of the first section is very undulating – including a hands-and-knees climb up a grass bank out of a steep valley after a couple of miles. The first section is the most interesting, with varied scenery and includes crossing the M62 through that farm in between the carriageways. From then on, the route climbs onto moorland, over Windy Hill and past countless reservoirs. The route description let me down at one point, and had me worried that I was lost on Saddleworth Moor, but fortunately I spotted the next checkpoint before I fell into a full-on panic. The runners soon became separated, and for the last 10 miles or so I didn’t see anyone at all. I enjoyed running alone across the moors in silence, it wasn’t as spooky as it sounds. It was nice to pass the final reservoir and drop back into Marsden though. I finished in 4.48, 11th out of 87 (mostly walkers). A few more dates for the diary in the coming weeks and if anyone wants to lift share, times of when to do so. Some great all round stuff coming up soon! Road Counters – This Wed Capenhurst 5k 7.15, race now full. For lift share please meet at club at 6.20. 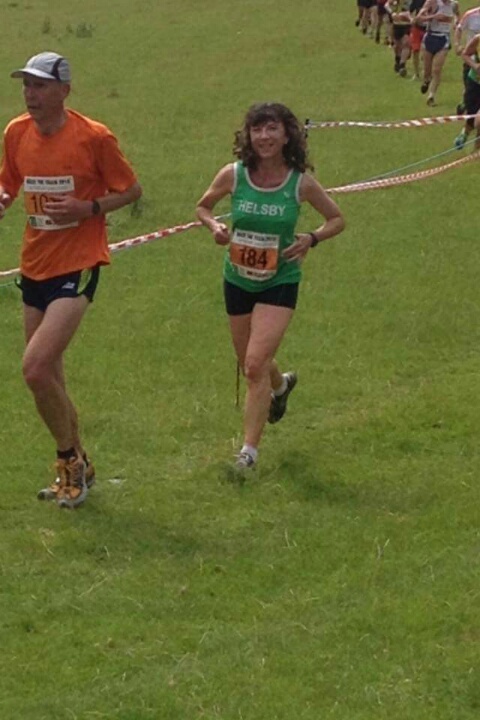 Sun 30th August Ellesmere 10k 11am, online entries still available, no entries on day. For lift share please meet at club at 9.30. Fell Counters, all these are good races to come and try for those new to fell running, particularly if it’s summer weather! Sat 22nd August Chipping Show, 2pm, 12k, 550m, BM. A great day out shared with the local agricultural show with all sorts going on for everyone! 1h30 min drive but could be busy so leave plenty of time, 11.30 from club for those who want to lift share. 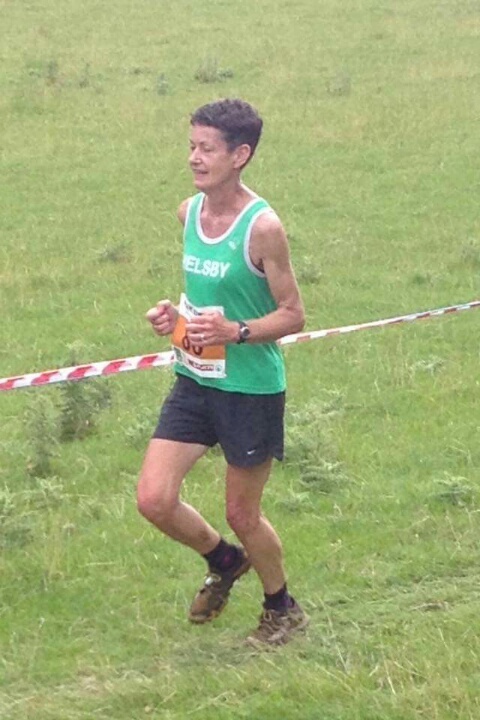 Mon 31st August Cilcain Fell Race, 1pm, 7.5k, 400m, AS. Bank Holiday Monday, again with a village show thrown in. Another splendid route up Moel Famau. Meet at club at 11.30. 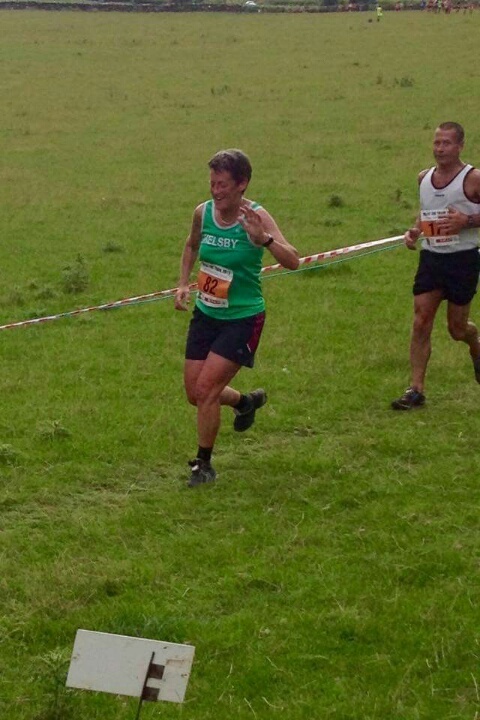 Sun 6th Sept Shelf Moor Fell Race, 11am, 9k, 500m, AS. Meet at club at 9.15. The club has entered 3 teams of 6 into the British Fell Relays on Oct 17th near Pendle in Lancashire. A pre-requisite of entering is to have ran at least 2 category A races in the last 2 years. So for those interested there is still time to qualify! More information to follow. And last but not least, Helsby night out is still going ahead, Friday 4th Sept, and rather than the usual Helter Skelter followed by Chum antics, we’ve decided to head off into Chester. Meeting in the old harkers arms from 7 onwards, I’ll be getting the 6.30pm train in Chester, few drinks around town then back on the last train home, and into Frodsham for anyone wanting to continue the drinking.